In one of my previous posts I spoke about the Economics of Corruption which explains the root causes of corruption and how the issue relates to the economic progress of various countries. With a slew of foreign enterprises looking to do business in India ,the Indian Government has taken a number of steps to reduce corruption. 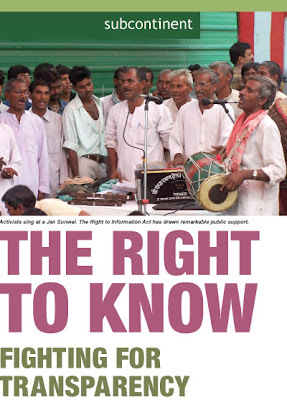 Not many people are aware that the Indian parliament has enacted the "Right to Informaction Act 2005" giving citizens of India access to public records. Under the provisions of the Act, any citizen may request information from a "public authority" which is required to reply expeditiously or within thirty days. The Act also requires every public authority to computerize their records for wide dissemination. Proactively publish certain categories of information so that the citizens need minimum recourse to request for information formally. take certified samples of materials of work. The official website is http://www.rti.gov.in/.The website explains the procedures to request information from various government agencies in a comprehensive manner. It also provides details of Public Info Officers who are designated to receive the Request for Information Applications on behalf of the government. Each Ministry and Government of various states have their own Public Info Officers. I searched on various search engines and was surprised to see the amount of information posted by various government agency websites about the RTI process ( Some of them are listed below). There are a number of reports in the media about proposed legislation that may weaken the RTI application. Assuming the RTI Act is not weakened , its a great tool in the hands of the citizens to make governmental offices accountable for their actions. When used collectively by all citizens it will force transparency in the government processes and slowly but surely reduce corruption. Now,its up to the citizens of India to play their part in using this tool to address the issue of corruption.